This summer, as you work to achieve the perfect lawn, consider steps you can take to contribute to a greener planet too. Here are five eco-friendly ways to make your lawn care green. Everyone wants a green lawn. Not only does it look good, it reflects a pride of home ownership that is undeniable. But there is a green lawn, and a GREEN lawn—one that’s beauty and care are a direct result of earth-friendly measures and practices. If you are doubting the claim for the latter, it’s more than possible. Here are five strategies to make you more eco-conscious as you strive to achieve the perfect summer lawn. According to the EPA, 30% of the 26 billion gallons of water consumed daily in the United States is for outdoor uses, with irrigation among the largest. Since lawns require only about 1 inch of water per week to remain green during the growing season, get smart by learning when to water and how much. The best time to water is very early in the morning, before the sun and wind increase evaporation. It will take less water to keep your grass hydrated if your sprinklers finish running by 7 or 8 a.m. Next, be sensitive to how much water. It’s better to water deeply and less frequently than to water a little bit every day. Watering less often promotes deeper root growth and makes grass hardier. The average American lawn receives far more pesticides per acre than farmland. Since chemical fertilizers and pesticides can run off into water supplies, they can kill the helpful organisms, like earthworms, that are vital to healthy soil. You can use organic products in place of chemical ones to control weeds and grubs. Corn gluten is a natural pre-emergent, and keeps weed seeds from sprouting, while adding nitrogen to your lawn. Milky Spore is effective at controlling Japanese beetle grubs, and is safe for humans, as well as birds, bees, pets, and beneficial insects. Within a year of using organic products, earthworms and other beneficial microbes will return to your lawn and help keep your soil in balance. More than 5% of the U.S.’s air pollution emissions comes from lawn mowers, according to the EPA. Using a fuel-less mower and yard tools, like those from GreenWorks, can help to keep hydrocarbons and carbon monoxide out of the atmosphere. The new G-MAX 20″ 40V Twin Force Mower—the first cordless electric mower to offer a dual blade cutting design—offers a variety of earth-friendly and labor-saving features that start with just a push of a button. 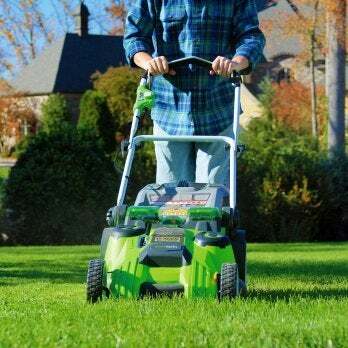 Offering up to 70 minutes of runtime from rechargeable twin 40V L-Ion batteries, the mower’s generous 20″ cutting deck and dual blades are engineered for improved cut quality and superior mulching. The 5-position single lever height adjustment also offers a range of cutting heights for the perfect cut on all grass types. Many people see grass clippings as a waste product—bagging them and leaving them at the curb. But grass clippings are an organic material that can enrich your soil and strengthen your grass. If they are not too long, you will do your lawn a favor by leaving them where they are. Grass clippings are mostly water, and if left on the ground, will start to decompose almost immediately, putting nutrients back into the soil. With the innovative dual blade design of the GreenWorks Twin Force Mower, you can get finer mulch while cutting making it easier for decomposition. If you can’t bear to leave clippings on your lawn, consider composting them. If mixed with other organic materials like leaves and kitchen waste, those clippings will make rich, dark soil you can return to your landscape. In reality, you should be feeding your soil, not your grass. Your soil is a living entity, so feeding the organisms, like earthworms that keep your soil healthy by doing what they do, you will be improving lawn growth. These creatures also need air, so aerate your lawn if it gets compacted by foot traffic or mowing. If your soil is rich in nutrients and naturally aerated, you won’t need to feed the grass with fertilizers. So this summer, as you work to achieve the perfect lawn, consider steps you can take to contribute to a greener planet too. This post has been brought to you by GreenWorks Tools. Its facts and opinions are those of BobVila.com.